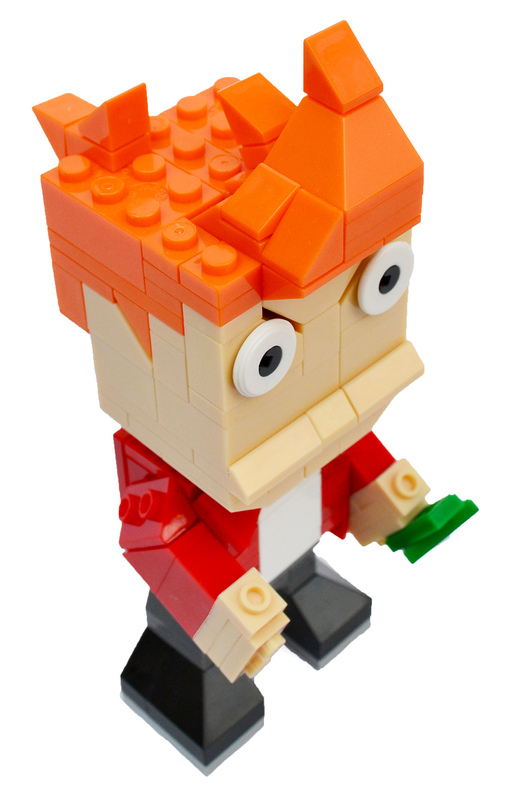 Fry from Futurama, by Mega Construx | 'TAIN'T THE MEAT… IT'S THE HUMANITY! 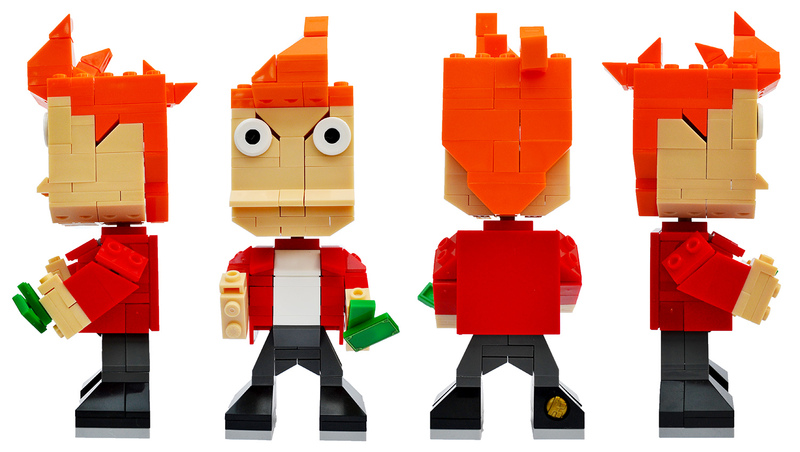 Fry, the hapless star of animated TV show Futurama has received the Mega Blok’s construct treatment. The brainchild by Matt Groening (creator of The Simpsons) and David X. Cohen Futurama debuted on TV in March 1999, and deftly weaved together comedy with science fiction. The show originally ran for four seasons on Fox before been resurrected in 2009 on Comedy Central, where it ran until 2013. Despite being a modest hit for Fox the animated comedy quickly gained a loyal fan following and the show still holds up remarkably well 20 years after its debut. 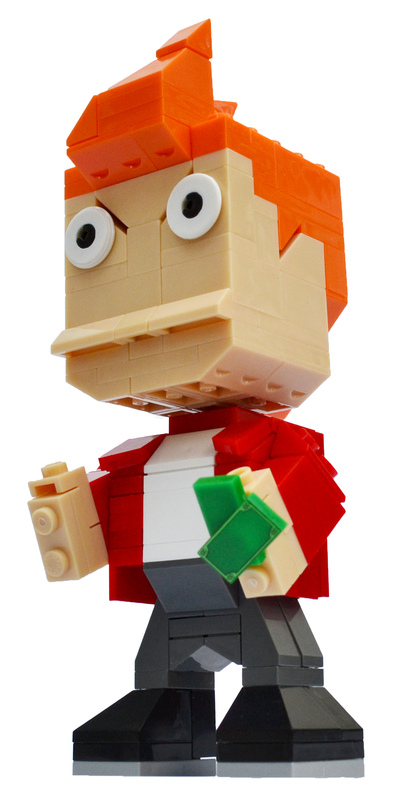 This Mega Bloks construct, released in 2016, pays homage to Philip J. Fry, a dim-witted but likeable delivery boy accidentally cryogenically frozen in 1999, and thawed out 1,000 years later. 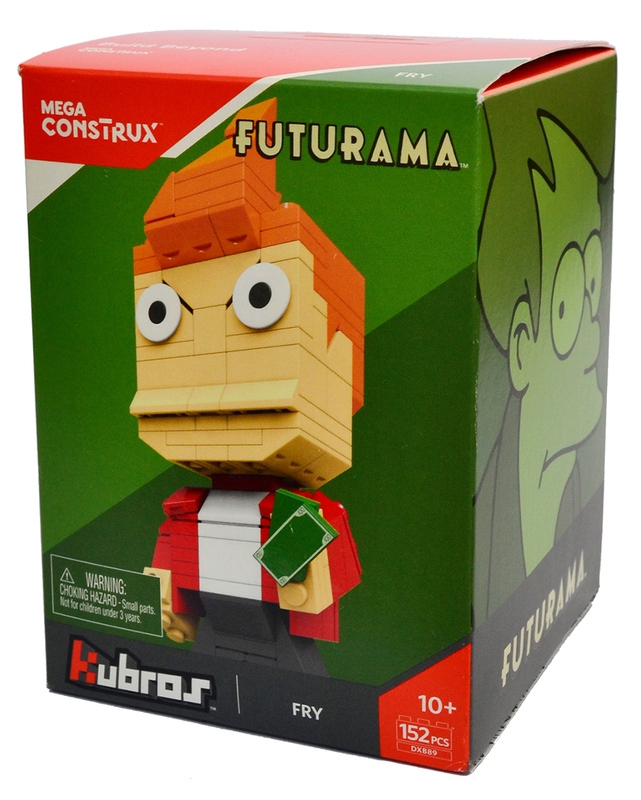 Fry was released by Mega Construx, which is part of the Mega Bloks toy company. The build is also labelled ‘Kubros’, although I’ve no idea why. There are five other models in this range: a pirate Minion; Malcolm from Firefly; Abe Sapien from Hellboy; Brian from Family Guy and a Spartan Recon character from the Halo game franchise. The kit comes in a full-colour box measuring 6 x 4 inches, with artwork that features photographs of the toy as well as a Groening cartoon of Fry. The back shows the six figures in this Mega Construx range of toys: Fry is number 30 in the series. The packaging is well designed and the photographs feature spot varnish. Overall the box is attractive and eye-catching, surprising bearing in mind’s the toy’s modest price tag. Although the box is glued at the top, the bottom flaps are held closed with tape which can easily be removed if you don’t want to damage the packaging when removing the contents. 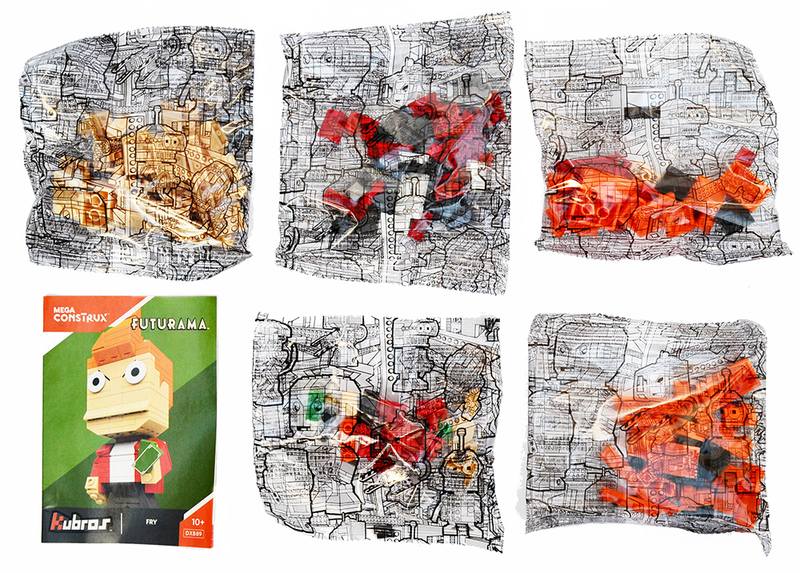 Inside the box are five transparent bags that contain the 152 pieces needed to build the model, as well as a 32-page instruction booklet. When building the toy it quickly becomes apparent that the bricks have been put in the bags in random order, so they’ll all need to emptied before construction can begin. The booklet is illustrated with clear pictograms, and the instructions are easy to follow. I like the detailing of Fry’s hair. The kit took me just under three quarters of an hour to make; all the pieces where there and I had a few extra pieces left over — this, amongst many others, is a trait Mega Bloks shares with Lego (more on this later). 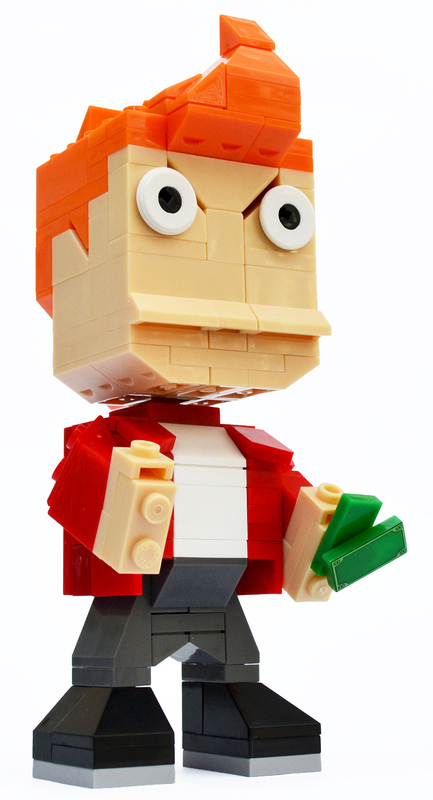 Fry measures five and a half inches in height when completed, and he looks pretty cool. The colours are bright and the pieces fit together snuggly. I particularly like the detailing of his hair: his quiff and the tuft at the back of his head are nicely done. I also really like his overbite. The kit also comes with ‘eye-lids’ that can be added and angled so Fry either looks angry or sleepy. I prefer the kit without them though as it better matches the animated character’s naturally wide-eyed expression. 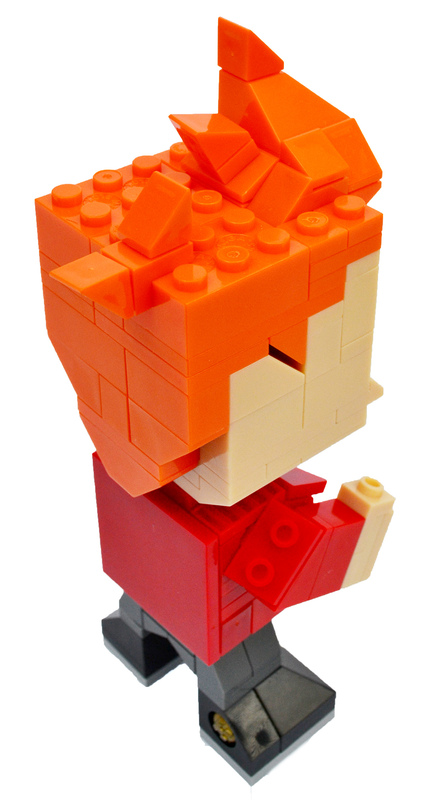 The model also features three points of articulation – Fry‘s head and arms all move. Fry also comes with two $100 bills that sit in his left had: this is either a reference to the episode where Fry discovers he’s a billionaire (A Fishful of Dollars, S01 E06), or the episode where Fry receives a £300 tax rebate (Three Hundred Big Boys, S04, E16). 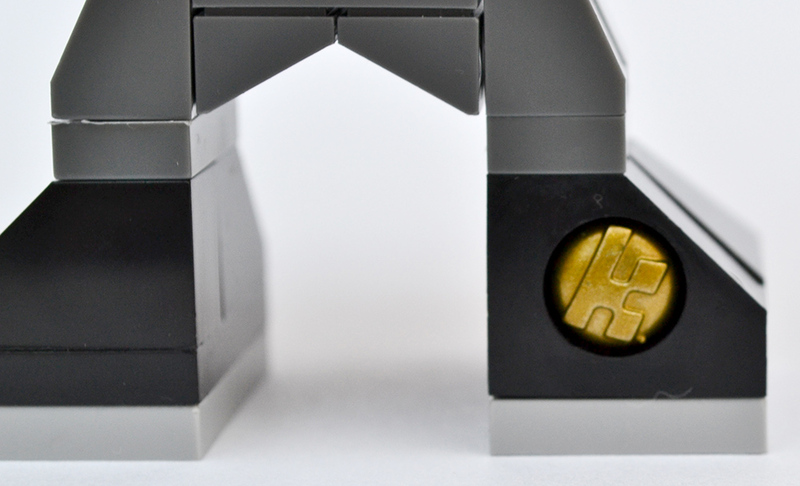 A small gold ‘K’ logo badge sits in the heel of each Mega Contrux kit. As for price, these Mega Construx kits retail for around £7/$10, which is about right. As nice as these models are I’m not sure I’d want to pay more than that for one. To even the most casual of observers Mega Bloks resemblance to Lego is obvious and undeniable. The shape and size of the bricks, their colour scheme, even the pictogram instruction book, are all clearly ‘based’ (a polite word for ‘ripped-off’) on the Lego standard. But as good as these kits are I doubt Mega Bloks will be challenging Lego’s seemingly unassailable mantle of king of the construction bricks anytime soon. However, to my knowledge Lego doesn’t offer a range of kits based on Futurama so until they do I’ll stick with this Fry construct, with which I’m more than happy. Now, if only Mega Bloks offered a Bender construct, or one based on Dr Zoidberg, then I’d really be chuffed.